Though relatively expensive, Lexmark's new mid-range inkjet multifunction is easy to use and manage thanks to a large touch screen and SmartSolutions widgets. Unfortunately, it is hampered by poor print quality and slow speeds. The Prestige Pro805 is Lexmark's newest mid-range business inkjet multifunction. It offers USB, Ethernet and Wi-Fi connectivity and a multi-card reader supporting SD, MemoryStick, xD and MMC. Its touch screen and SmartSolutions widgets make it easy to use, but we weren't impressed by its speed and print quality. The Lexmark Prestige Pro805's PictBridge USB port can read from flash drives and print photos as well as Word documents and PDFs (unlike the Canon PIXMA MP640). Once print drivers have been installed you can easily scan to computers over Ethernet or Wi-Fi, and you can even e-mail scanned images directly from the Prestige Pro805. The contents of memory cards and flash drives can be accessed when the printer is connected directly to a PC via USB or over a network. They don't appear as shared network folders, but Lexmark provides its own utility that lets you access files. Quick access buttons on the control panel are only visible when they are usable. 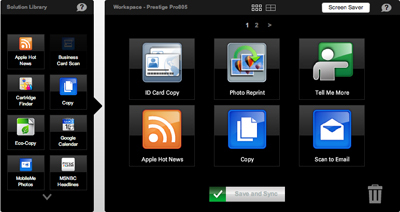 The Lexmark Prestige Pro805's 4.3in touch screen is easy to use. The screen isn't always as responsive as we would like, but quick access buttons (cancel, start and home) conveniently disappear when they aren’t an available option. The multifunction boasts Lexmark's new SmartSolutions feature. This allows you to download and install widgets on the printer via the SmartSolutions Web site — Google Calendar, RSS feeds and photo viewers, for example (the process is quite similar to installing widgets on the Chumby Chumby). Some widgets like "Scan to Email" and "Eco Copy" allow you to create specific settings profiles for the printer, for example scanning and sending to a particular e-mail address with one press. A Web-based interface could be used for a similar purpose, but the easy set up and ability to sync the same widgets to multiple printers make SmartSolutions useful for printer administrators. The SmartSolutions Web site lets you configure widgets for your Lexmark printer. Though the site works on both Windows and Mac OS X, not all widgets are platform agnostic. For instance, Lexmark's much touted "Business Card Scan" widget — which scans, OCRs and automatically inserts contact information into selected address book applications — can only be installed using Windows. Lexmark's Prestige Pro805 isn't the fastest printer available at this price point. However, its draft-quality documents are more readable than those produced by the HP Officejet Pro 8500 Wireless. Unfortunately, its overall print quality is below average. Text isn't very accurate, but it is readable at all font sizes. Colours in graphics are highly saturated. Even when dry retain they an inky look that easily warps standard 80gsm paper. Photo quality is usable for basic presentation documents, but certainly won't suit the professional. Black levels are good but lack detail. Lexmark doesn't bundle any photo printing software with the Prestige Pro805 inkjet multifunction, so you'll have to suffice with third-party programs or basic print settings. Using Lexmark’s high yield consumables, you can expect a running cost of 23c per A4 page from the Prestige Pro805 inkjet multifunction; this is quite high for a printer at this price point. 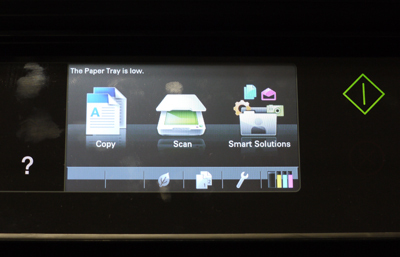 Though the SmartSolutions widgets mean you won't have to constantly fiddle with scan settings, you can access them on the printer when necessary. There is also an e-mail address book and history, so you can quickly send scanned images to co-workers, for example. The scanned images themselves are detailed and of good quality, though the 600dpi maximum resolution won't suit specialist tasks like scanning negatives and slides. The touch screen and SmartSolutions features of the Lexmark Prestige Pro805 inkjet multifunction make it easy to use and manage, but this printer fails to print well or quickly. Nevertheless, those looking for an easy-to-use multifunction with one-touch settings profiles may want to take a look.